Hi friends! I know, I know…we haven’t even gotten to Thanksgiving, but this year we put up our tree a little earlier (#donthate) because we will be out of town for Christmas and we wanted to savor it as long as we could. So the tree is up, the music is playing and the baking is happening and we aren’t mad about it one bit. Sometimes a little earlier is just a little sweeter. 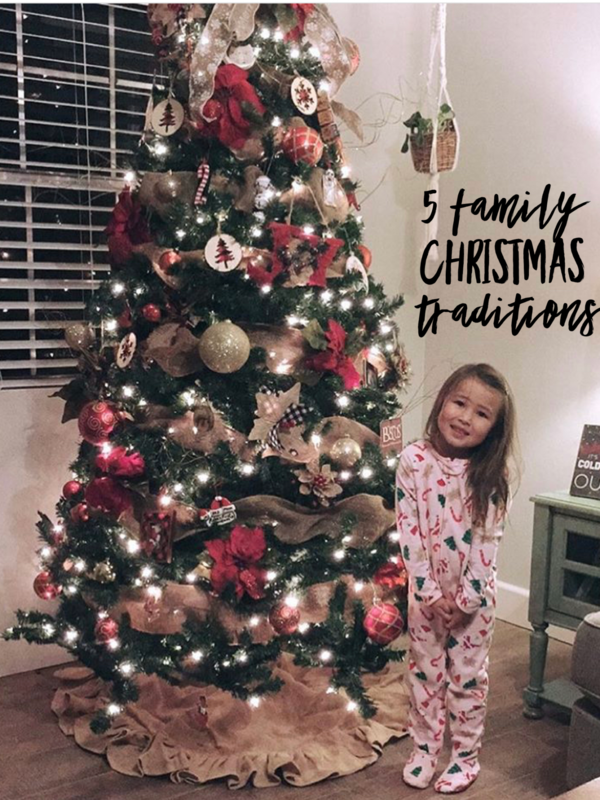 Since we are in the spirit I thought it would be fun to share our top 5 Christmas traditions. 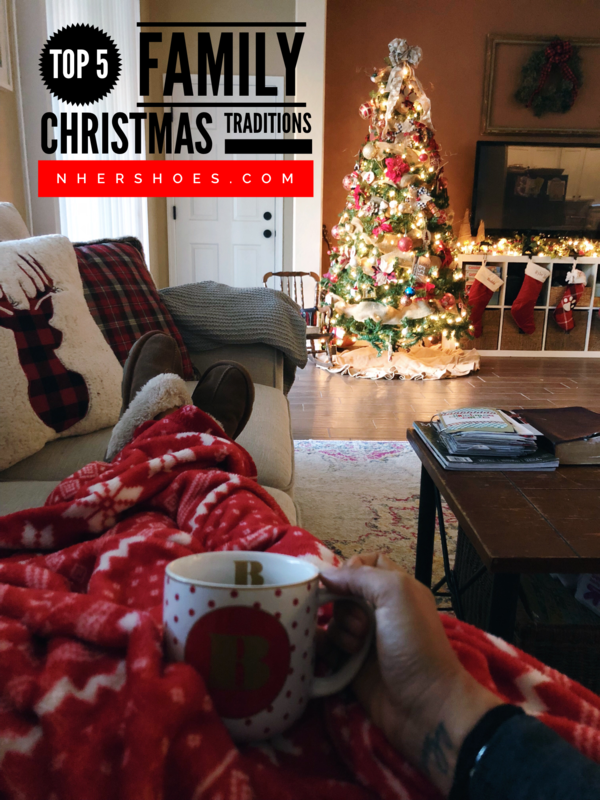 We have a ton of things we love to do, but more than anything we love to make memories just being home and cuddling on the couch with a good Christmas movie. Decorating the Tree: On the night we decorate the tree we love to bake chocolate chip cookies, watch the movie elf and sip on some egg nog! We also started the tradition this year of having a nice dinner at home by candlelight to pray over the busy season. Christmas Lights: We love to look at Christmas lights in our neighborhood. We bundle up, grab some hot coco and jump in the car to look at lights as a family while we blast Christmas lights. This year we can’t wait to check out our new neighborhood lights! Books: We wrap 24 Christmas Books and each night we open a new one and read to RJ leading up to Christmas. Our last book is The Three Trees and we cry every time we read it. You don’t have to buy all new books, head to the library and check them out! Or go to the goodwill and get some for super cheap. We bake for our neighbors: We love to back cookies for the neighbors each year. We get the kitchen super messy, but it’s worth every bit of cleaning. This year I think will be one of the best since RJ has become quiet the little chef! Ever Thine Home His Name Ornaments: This we started last year and we can’t wait to do it again. Each ornament represents a name of Jesus and has a story to read with it. We do one to two weekly leading up to Christmas Eve. It’s a great way to keep Jesus at the center of the season! Something you can find me doing is sipping on a hot drink while watching a Hallmark movie every night after 8pm, if you are local please come join me! This is our first year in Verrado and I think it will be truly amazing! Lots of fun things to do in our cute little town. A christmas tree lighting ceremony, carols in the park, bunco, christmas cookie decorating and much much more! But more than anything we are exited to celebrate the birth of our Savior and celebrate kindness, love and grace with all we know. So friends, what is your favorite Christmas tradition?